Background: Assessing nutritional status and delivering optimal nutritional care is a part of modern day treatment of children with cancer. The nutritional practices in India for these children have not been previously described. Aims: To describe the existing nutrition assessment and management practices for children with cancer in India. Methods: Attendees of the First International Society of Pediatric Oncology-Pediatric Oncology in Developing Countries workshop on nutrition in children with cancer organized in September 2014 at Tata Memorial Hospital, Mumbai, India were invited to complete a self-administered questionnaire related to three domains: nutritional assessment, intervention, and education. Results: Hundred and eight respondents from 42 health institutions and background in the health sector participated in the survey. There was variability in nutritional assessment, practice and education. Lack of resources and time are contributory. Conclusions: This assessment of nutritional services in India provided useful information to plan development of national guidelines, policy, and delivery of services. Cancer is the leading cause of death worldwide accounting for 8.2 million deaths in 2012. It is generally regarded as a disease of adults. In the developed countries, <1% of cancers occur in children below 15 years of age. However, in India where the children comprise more than a third of the population, the proportion of childhood cancers can be up to 5% of the overall cancer burden. It is estimated that worldwide there are 200,000–250,000 new cases of cancer in children <15 years of age every year out of which 40,000–50,000 occur in India. Till recently, information on nutritional care in children with cancer has been restricted to reports from institutions in high-income countries (HIC) which show an inconsistent approach to both assessment methods and nutritional intervention., More recently in 2014, an international survey of nutritional practices in LMIC assessed the nutritional practices in 96 institutions in 50 countries including India. This not only confirmed the previous observation of inconsistencies in nutritional care but also highlighted the lack of human and material resources related to nutrition in LMIC. We decided to identify and describe the existing nutrition assessment and management practices for children with cancer in India by conducting a survey. The First International Society of Pediatric Oncology (SIOP)-Pediatric Oncology in Developing Countries (PODC) workshop on nutrition in children with cancer was organized on September 27 and 28, 2014 at Tata Memorial Hospital, Mumbai, India with a total of 254 participants including dieticians, doctors, nurses as well as international faculty. During the workshop, a self-administered questionnaire was distributed to Indian participants. In addition to demographic information, the survey focused on three domains: Nutritional assessment, nutrition intervention, and education on nutrition. Responses were collected prior to completion of the conference. The data were collated and a descriptive analysis performed in Microsoft Excel. Frequency tables with percentages are presented. A total of 108 participants from 42 different health institutions and backgrounds in the health sector participated in the survey [Table 1]. Half of the participants responded that they routinely do use some form of nutritional assessment. More than 40% participants responded that nutrition assessments were performed at their institutions only when clinically indicated. Nutritional assessment was done most commonly by dieticians (68%) followed by doctors (28%), nurses and social workers. Nutritional assessments were done most commonly using height and weight. 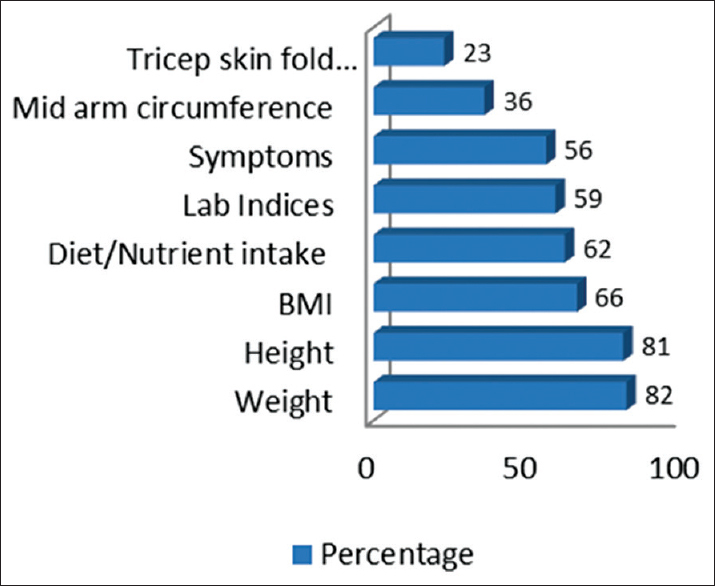 Mid-upper arm circumference (MUAC), triceps skin fold thickness (TSFT) was used less commonly [Figure 1]. Almost 64% of respondents reported that clinical dietician was available in their service on a routine basis, and 6% responded that dieticians were available occasionally. In the absence of dieticians, doctors provided the nutritional support as needed. The role of a clinical dietician, where available, included nutritional support with oral supplements (61%), nutritional assessment (60%), enteral feeding (52%), other dietary supplements (50%), parenteral feeding (45%), and research (29%). The enteral supplements advised were largely home based, although a substantial number prescribed industrial feeds as well. Often such feeds made available to patients were subsidized in government hospitals with the support of various nongovernmental charitable organizations. Barriers for delivery of nutritional assessment and intervention include lack of dieticians, limited time and resources and absence of nutritional guidelines. Sixty-nine percentage respondents reported that education on nutrition is provided routinely to all patients/families in their institution. Where education was not delivered routinely, lack of time was cited as the most common barrier. The content of nutritional education was developed from multiple resources–international guidelines, institutional guidelines, recent conferences, and published research as well as textbooks. Several respondents expressed the absence of good educational material and the need for addressing the deficiency. Nutritional education was delivered in various formats such as health talks, one to one counseling, development, and distribution of printed material in the local language, posters, and charts. Under-nutrition in children with cancer in India is a significant problem with 52–65% under-nourished at diagnosis when weight for age ,,,, is used as a criterion and 36–84% under-nourished when indices such as MUAC and TSFT are used., There is a significant impact of the suboptimal nutritional status with an adverse effect on the timely delivery of treatment and outcomes.,,, In such a context, it is vital that we are able to deliver the nutritional support so as to achieve better outcomes. Hitherto, there has been no published information on the nutritional practices in children with cancer in India. The First SIOP PODC Nutrition workshop provided a timely opportunity to survey all stakeholders – doctors, nurses, dieticians, academicians, and establish the baseline. It is important to highlight that the study has limitations. This study used an adapted questionnaire to obtain the baseline information as mentioned earlier during an international workshop. An interview schedule would have elicited more consistency in the responses. Our survey establishes that there is a deficiency of provision of nutritional services in relation to assessment, support and education. And where these are delivered, there is variability in existing practices for children with cancer in India. These findings are similar with those of the recently published international survey  as well as to those from previous surveys in HIC., Salient similar findings among all these surveys include: Nutritional assessment is not standard but often when clinically indicated; over-reliance on weight, height and laboratory parameters and infrequent use of MUAS and TSFT for assessing nutritional status; inconsistencies in the use of enteral and paretneral nutritional interventions; and lack of staff, resources and knowledge to deliver effective interventions and education. While the challenges seem universal, the lack of resources is likely to be more in LMIC like India. The problem is further compounded by the degree of under-nutrition at diagnosis in these patients which is also greater than that seen in HIC., Nutritional intervention for children with cancer is challenging and is compounded by an incomplete understanding of the etiologies of suboptimal nutritional states in this population , and a paucity of evidence regarding the clinical efficacy of interventions. In such a context, it is not surprising that there is variability in existing nutritional practices for children with cancer. When the challenges are similar in the global context, many of the solutions will be the same. Some of these have already been suggested and include improved nutrition education and assessment tools for doctors and nurses; increased availability of nutrition education resources for families and patients; development of uniform guidelines; and more research into nutritional interventions.,, Examples of guidance for health professionals  and for caregivers , in HIC are available, and similar resources have to be developed for LMIC. A nutritional assessment and intervention algorithm has been developed in Central America  and comparable algorithms are being developed and validated by the SIOP PODC nutrition working group to be used across LMIC. The SIOP PODC Adapted regimens working group has also published guidelines for supportive care including nutritional care in LMIC. Cankids is a grass-root level national society committed to making a change for childhood cancer in India of over 225 individuals (volunteers and employees) and currently works in 42 cancer centers across the country. The Treatment Support Program of Cankids, which undertook this survey, is synergizing with these global efforts and a national platform (National Interest Group on Childhood Cancer Nutrition) has been established for networking and discussion among all stakeholders. This would help guide and inform decisions and plans for next steps in Cankids. Work on national nutritional assessment and intervention guidelines relevant in the Indian context is in the process. This would be complemented by the development of evidence-based, user-friendly and culturally appropriate information, education, and communication material. Sala A, Rossi E, Antillon F, Molina AL, de Maselli T, Bonilla M, et al. Nutritional status at diagnosis is related to clinical outcomes in children and adolescents with cancer: A perspective from Central America. Eur J Cancer 2012;48:243-52. Ladas EJ, Sacks N, Brophy P, Rogers PC. Standards of nutritional care in pediatric oncology: Results from a nationwide survey on the standards of practice in pediatric oncology. A Children's Oncology Group study. Pediatr Blood Cancer 2006;46:339-44. Murphy AJ, Mosby TT, Rogers PC, Cohen J, Ladas EJ. An international survey of nutritional practices in low- and middle-income countries: A report from the International Society of Pediatric Oncology (SIOP) PODC Nutrition Working Group. Eur J Clin Nutr 2014;68:1341-5.
kumar R, Marwaha RK, Bhalla AK, Gulati M. Protein energey malnutrition and skeletal muscle wasting in childhood acute lymphoblastic lukemia. Indian Pediatr 2000;37:720-6. Jain V, Dubey AP, Gupta SK. Nutritional parameters in children with malignancy. Indian Pediatr 2003;40:976-84. Linga VG, Shreedhara AK, Rau AT, Rau A. Nutritional assessment of children with hematological malignancies and their subsequent tolerance to chemotherapy. Ochsner J 2012;12:197-201. Roy A, Saha A, Chakraborty S, Chattopadhyay S, Sur PK. Effects of pre-existing undernutrition on treatment-related complications and treatment outcomes in children with acute lymphoblastic leukemia: A tertiary care center experience. Clin Cancer Investig J 2013;2:143-8. Tandon S, Moulik NR, Kumar A, Mahdi AA, Kumar A. Effect of pre-treatment nutritional status, folate and Vitamin B12 levels on induction chemotherapy in children with acute lymphoblastic leukemia. Indian Pediatr 2015;52:385-9. Brinksma A, Huizinga G, Sulkers E, Kamps W, Roodbol P, Tissing W. Malnutrition in childhood cancer patients: A review on its prevalence and possible causes. Crit Rev Oncol Hematol 2012;83:249-75. Jones L, Watling RM, Wilkins S, Pizer B. Nutritional support in children and young people with cancer undergoing chemotherapy. Cochrane Database Syst Rev 2010:CD003298. Royal College of Nursing. Nutrition in children and young people with cancer 2014. Available from: https://www.rcn.org.uk/-/media/royal-college-of-nursing/documents/publications/2014/october/pub-003805.pdf. [Last accessed on 2015 Sep 17]. American Cancer Society. Nutrition for Children with Cancer; 2014. Available from: http://www.cancer.org/acs/groups/cid/documents/webcontent/002902-pdf.pdf. [Last accessed on 2015 Sep 17]. Children's Cancer & Leukemia Group. Helping Your Child to Eat; 2014. Available from: http://www.cclg.org.uk/products_files/CCLG-HelpingYourChildToEat-2014.pdf. [Last accessed on 2015 Sep 17]. Sala A, Antillon F, Pencharz P, Barr R; AHOPCA Consortium. Nutritional status in children with cancer: A report from the AHOPCA Workshop held in Guatemala City, August 31-September 5, 2004. Pediatr Blood Cancer 2005;45:230-6.